This year’s goals are evaluated for their potential to further racial and gender justice, fulfill our Lutheran social statements and messages, and address key policy concerns of ministries across the U.S.
ELCA Advocacy is working to protect God’s creation from the impacts of climate change by encouraging policies that reduce greenhouse gas emissions while ensuring a just transition to renewable energy occurs and necessary steps are taken to make sure all Americans have access to clean water. ELCA Advocacy encourages Congress and the White House to address the urgent need for protection of vulnerable migrant children and families from Central America, while also focusing on long-term solutions that create safe, sufficient and sustainable livelihoods for all. ELCA Advocacy urges Congress to protect and reauthorize federal programs that help end hunger in the United States. Continue to fund humanitarian relief and development programs that address extreme hunger and poverty around the globe. 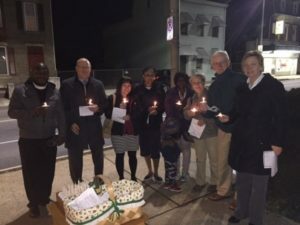 ELCA Advocacy continues to work toward the elimination of gender-based violence around the world by supporting the International Violence Against Women Act and educating Congress on the importance of addressing this problem in the U.S. and globally. As part of our commitment to challenge systems of racial and economic injustice, ELCA Advocacy urges Congress to pass sentencing reform that shifts our nation’s model of criminal justice from one that criminalizes addiction for the benefit of the prison industry to one that focuses on treatment and support for our communities. ELCA Advocacy, through the Peace Not Walls Network, continues to call for a peaceful and lasting negotiated resolution to the Palestinian Israeli conflict. MIGRATION POLICY: President Donald Trump signed several executive actions on immigration enforcement and refugee policy restrictions last week, in a move that received critical backlash from the faith community. In addition to highly publicized orders to begin construction of a wall along the border with Mexico and ending federal grants to so-called ‘sanctuary cities,’ the Executive Order also calls for an increase of the detention of migrants and implements measures that cripple the asylum system. Subsequent executive actions included halting migration from seven predominantly Muslim countries and pausing the refugee resettlement program for 120 days. ELCA Advocacy sent an action alert Thursday encouraging our network to contact their Members of Congress to support compassionate policies that provide safety for vulnerable people. Congress will be able to impact the outcomes of the Executive Orders by allocating or restricting funds to agencies that will implement them. Our faith partner, Lutheran Immigration and Refugee Services and Presiding Bishop Eaton likewise shared statements voicing concern on weakening refugee protection policies. With details and the future of refugee resettlement and protections still unclear, ELCA Advocacy will continue to monitor and share details on the evolving situation. More executive actions impacting migrants are expected in the coming weeks. PRESIDENT ACTION ON HEALTHCARE: At the start of the 115th Congress, lawmakers formally adopted a budget resolution, completing the first procedural step toward repealing the Affordable Care Act (ACA). Legislators did so without offering a plan for a replacement, an action that could possibly leave millions of Americans without health insurance and significantly raise taxes on middle and low income families. ELCA Advocacy and Lutheran Services in America encouraged people of faith to speak out in favor of responsible action for health care. Prior to the passage of the Budget Resolution, ELCA Advocacy sent out an action alert urging Congress to not repeal the 2010 healthcare law without first implementing a replacement that actively promotes the wellbeing of those experiencing poverty or illness in the U.S.
U.S. STATE DEPARTMENT SUPPORTS THE GREEN CLIMATE FUND: On Jan. 18th, just prior to the start of the Trump Administration, the U.S. State Department announced that it had provided an additional $500 million grant to support the Green Climate Fund (GCF). This brings the total U.S. contribution to the GCF to $1 billion—reinforcing our national commitment to challenging climate change. The Green Climate Fund is dedicated to protecting the most vulnerable among us from the impacts of climate change. It provides funding to foster developing nations’ efforts to adapt to a changing climate, and will help communities build technologies to reduce greenhouse gas emissions. This latest decision came after thousands of Lutherans and other faith advocates voiced their support for the investment last year. As an ELCA Advocacy issue priority for 2015 and 2016, we celebrate the additional funding that the U.S. will contribute to the GCF, as it builds solidarity in our shared responsibility to care for creation. SECRETARY GENERAL FIRST ADDRESS: On Jan. 10, U.N. Secretary-General António Guterres, delivered his first address to the Security Council. In an open debate organized by Sweden, which currently holds the Security Council’s presidency, he outlined his partnership priority with the Security Council, emphasizing the need for increased conflict-prevention measures. Guterres highlighted the need for an integrated approach toward conflict prevention and lasting peace, emphasizing his desire to integrate differing U.N. pillars toward this goal. He commended civil society in its role of raising an alarm and saw the need for the U.N. to partner with all sectors of society. All delegations welcomed his remarks and highlighted the need for multilateral action, strong institutions, and political solutions to conflicts. COMBATING MUSLIM DISCRIMINATION: The Permanent Missions of Canada, the United States, the Organization of Islamic Cooperation and the delegation of the European Union sponsored a forum on combatting anti-Muslim discrimination and hatred. The forum highlighted the growing challenges of anti-Muslim discrimination and hatred in various regional and national contexts. The event cited examples of local collaboration in Dallas and Tennessee, as well as coordinated advocacy following attacks on mosques. Noteworthy was the panel on positive narratives to promote pluralism and inclusion. It raised the importance of telling stories (personally and via various media such as television, film, radio and social media) which often are more effective than a recitation of statistics. PACIFISM AND WEST AFRICAN ISLAM: The Council on Foreign Relations hosted an interactive dialogue with Dr. Lamin Sanneh, discussing his new book, “Beyond Jihad: The Pacifist Tradition in West African Islam.” Professor Sanneh began by commenting that Africans converted to Islam peacefully. Much of his analysis drew from the American experience, comparing the role of religion as a catalyst for civil society – an important actor in nurturing and bolstering civil society. He argued that there is a peaceful impulse of Islam, often corrupted when mixed with politics. On Jan. 23, the World Council of Churches, the United Methodist Church and the Seventh-day Adventist Church organized the Third-Annual Symposium on the Role of Religion and Faith-Based Organizations in International Affairs, in partnership with the U. N. Office on Genocide Prevention and the Responsibility to Protect, the U. N. Inter-Agency Task Force for Engagement with Faith-based Organizations and the Committee of Religious NGOs at the United Nations. The symposium addressed cooperation among faith-based organizations, member states, civil society and international and regional organizations, including the United Nations, in fostering just, inclusive and sustainable peace. Gov. Jerry Brown, facing a round of prostate cancer treatments, delivered a stemwinder State of the State address, defending California’s leadership on immigration, health care, and climate change, issues in which LOPP-CA is engaged. 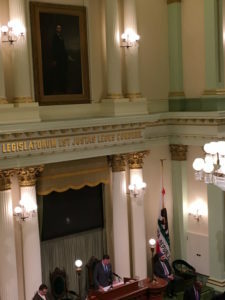 The Legislature ratified the appointment of U.S. Rep. Xavier Becerra, of immigrant roots, as the state attorney general, after extensive questioning and debate on the First and Second Amendments. 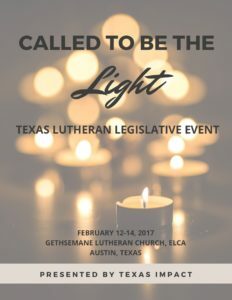 LOPP-CA has organized an ELCA table for the annual MLK Gala, with a program ad that links Martin Luther’s 95 theses with the Rev. Dr. King’s “Letter from the Birmingham Jail” (from Presiding Bishop Elizabeth Eaton’s statement). CARE FOR CREATION: Mark will be attending the initial 2017 policy briefing by the CA Environmental Justice Alliance, and plans are firming up for LOPP-CA to be a host site, at St. John’s Lutheran Church, for the Trinity Institute, March 22-24: “Water Justice.” At the California Climate Change Symposium, state Food and Agriculture Secretary Karen Ross, a Lutheran, got the loudest applause on a panel that included the secretaries of the Resources Agency and CalEPA and the president of the Public Utilities Commission (PUC), when she called on the hundreds gathered to defend science, and for scientists to stand up (the PUC chair said he feared a “federal lobotomy). LOPP-CA is promoting the March 11 annual Yolo Interfaith Climate Justice conference, keynoted by professor Cynthia Moe-Lobeda. LEGISLATIVE SESSION BEGINS: The Colorado General Assembly began its 2017 session on Jan. 11. Lutheran Advocacy Ministry-Colorado will advocate on its anti-poverty, pro-dignity agenda throughout the 120-day session. REFUGEE ADVOCACY: Our partners at Lutheran Family Services Rocky Mountains have led an advocacy effort to encourage members of Congress to not halt or severely curtail refugee resettlement efforts in the United States. We join their call to our elected leaders to live up to the United States’ proud heritage of being a place of welcome and refuge for those fleeing violence and discord. DEATH PENALTY REPEAL: The Colorado Legislature will take up the question of repealing the state’s death penalty statue in February. Senate Bill 17-095, sponsored by Sen. Lucia Guzman and Rep. Alec Garnett, would eliminate capital punishment. The bill is supported by a broad coalition of faith leaders and other criminal justice advocacy groups. OTHER ENDORSEMENTS: LAM-CO has endorsed several measures so far this session, including HB 17-1002, extending the state’s child-care expenses tax credit, and HB 17-1116, continuing an energy bill assistance program for low-income households. FAITH ADVOCACY DAY: We encourage all local advocates to join us on Feb. 11 for Colorado Faith Advocacy Day! Register at www.lam-co.org. The 2017 legislative session began with intensity since the current fiscal year’s state budget was out of balance by about $70 million and the state constitution prohibits the state from deficit spending. Consequently, the first eight days of the session were used to pass four solvency bills. LAM-NM is working with several groups to advocate that next year’s state budget not be balanced through further severe programmatic cuts but that increased revenue be sought. LAM-NM Director Ruth Hoffman was one of about 400 people who recently met with New Mexico congressman Ben Ray Lujan to urge him to protect the Affordable Care Act and to particularly protect the Medicaid program, which covers almost 900,000 low-income New Mexicans. LAM-NM joined other advocates to testify for an increase in the state minimum wage during a legislative hearing of the House Labor and Economic Development Committee. The bill passed that committee and now moves to another committee for consideration. 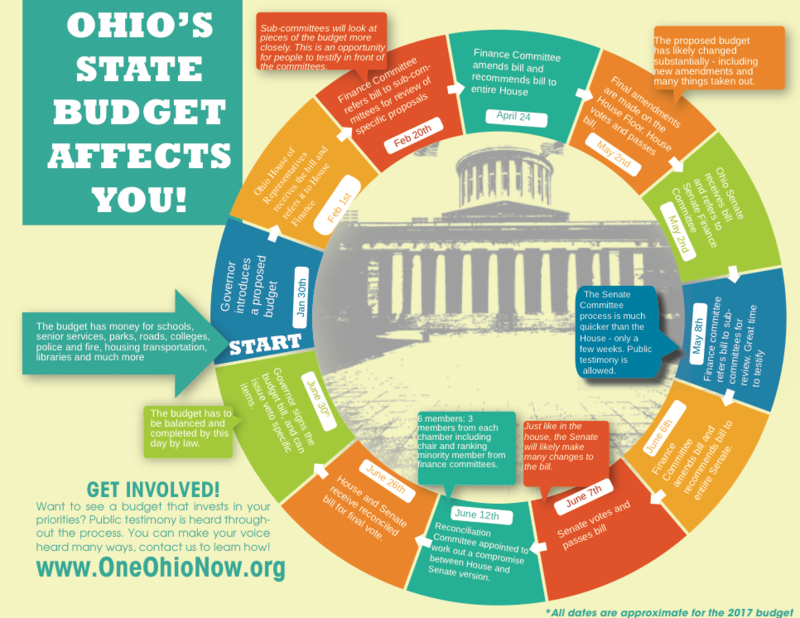 The Ohio budget was released on the 30th during the afternoon and hearings began on the 1st of February in the Ohio Legislature. (See the budget process here). and yet you do not supply their bodily needs, what is the good of that? If you would like to see the full letter (AND SIGN ON YOURSELF! ), please click here! LAMPa Policy Council member the Rev. 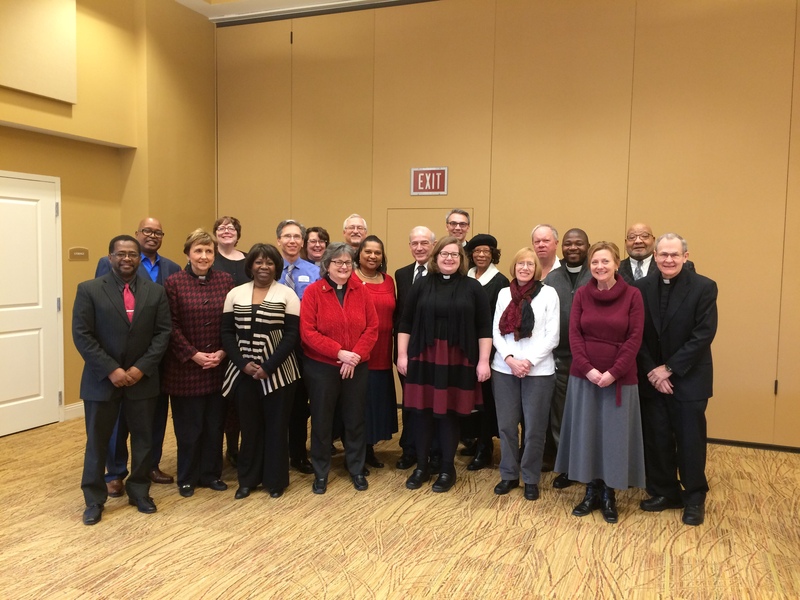 Titus Clarke and LAMPa Director Tracey DePasquale participated in a joint meeting of York Conference Lutherans and members of the York Black Ministerium shortly before Martin Luther King Jr. Day. 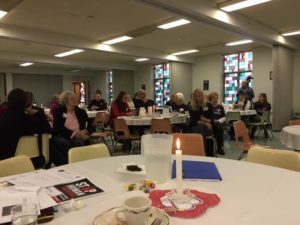 The meeting, hosted by SpiriTrust Lutheran, focused on commonalities and how the faith leaders and their congregations could work together to serve the community, including addressing racism. Re-entry for returning citizens was named as one possible area of joint service and advocacy. The faith leaders will continue to build relationships, with a goal of worshiping, serving and advocating together on MLK Day 2018 (See picture). LAMPa also partnered with Pennsylvania Power & Light to promote vigils for climate change around the first 100 hours of the new administration. Among the congregations participating was St. Mark’s Lutheran in York (see picture). 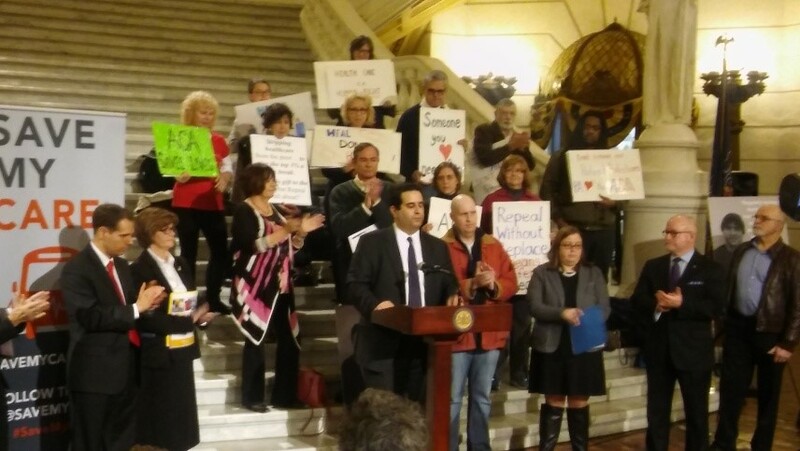 As part of InsurePA, LAMPa attended a rally in defense of health care for all Pennsylvanians on Jan. 23 to highlight the risks to Pennsylvanians of repealing the Affordable Care Act (see picture). In February, Tracey will meet with First Lady Frances Wolf to work on school breakfast expansion. LAMPa is also preparing for the Feb. 7 budget address. It has been an exciting and busy month. We had our first Policy Council meeting at Lutheranch. It was very productive and invigorating. Our Policy Council is made up of two people from each state, as well as Bishop Julian Gordy, a liaison from synod council, and myself. While we have been quite active in Georgia and Tennessee, we now have the ability to organize in Alabama and Mississippi. We continue to work on improving communication between the four states. We are currently preparing for our annual advocacy gathering to be held at St John’s Atlanta on Feb. 11. Sherry Boston, Dekalb County district attorney, will be one of our morning speakers. There will be five workshops to choose from in the afternoon: Criminal Justice Reform, How to Write an Op-ed, Care for Creation, Advocacy 101, and Immigration/Refugee Resettlement; the topic of the immigration workshop is still to be determined depending on the new administration’s actions. 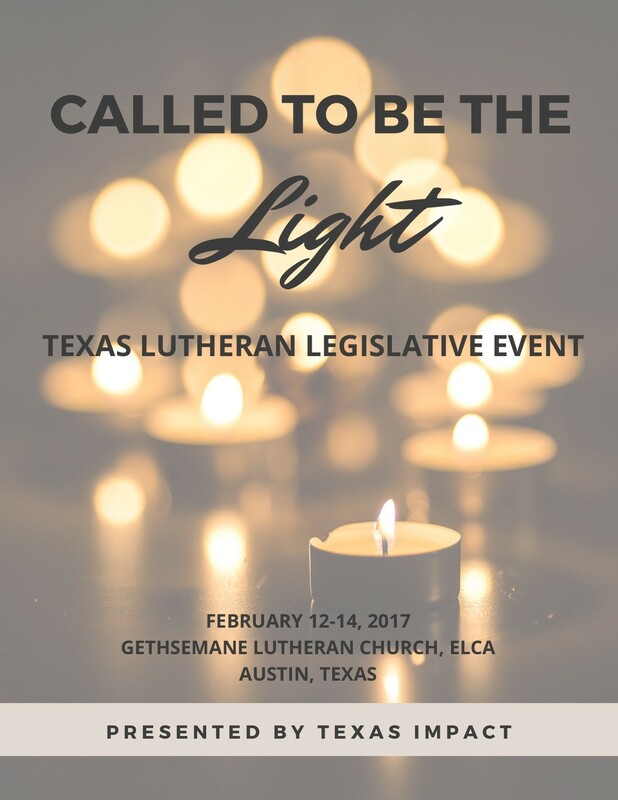 In late January, Texas Impact sponsored the eighth- annual United Methodist Women’s Legislative Event in Austin. The Lutheran and Methodist events are similar in scope and content. The Methodist event had a great number of “first timers,” more than ever before. Staff members at Texas Impact are thrilled at the level of congregational enthusiasm toward Methodist advocacy and see similar determination as they watch the number of Lutheran registrations increase daily. Staff at Texas Impact are noticing a significant increase in activity from Lutheran synods, congregations and individuals. It appears that more people of faith are developing an interest in faith-based advocacy as we advocate for gospel principles and lift the voices of the poor and the disenfranchised. 2017 LEGISLATIVE SESSION: Washington’s legislative session is now in its third week, and FAN’s lobby team is visiting with legislators and testifying in support of many of the issues on FAN’s Legislative Agenda, in particular, a solar tax incentive bill and a package of wage theft prevention bills. This year, many of those issues could be addressed by the biennial state budget, including funding for K-12 education, Washington’s mental health system, an office of civil legal aid, small-farm direct marketing and farm to school programs, and youth homelessness prevention. WOMEN’S MARCH: FAN advocates gathered on Jan. 21 to participate in the Washington State Women’s March. They joined an estimated 175,000 marchers in Seattle and 10,000 in our capital city, Olympia. 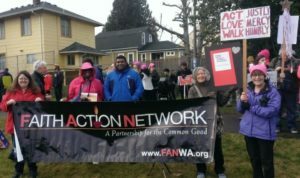 FAN advocates marched for a variety of causes, including racial and gender equity, sexual assault awareness, access to health care, and protecting the environment (see photo). INTERFAITH ADVOCACY DAY: On Feb. 9, FAN will be bringing hundreds of advocates from all over the state to our annual Interfaith Advocacy Day. We’re excited to bring people of many different faith traditions to engage with interfaith and legislative speakers, workshops, and caucuses by legislative district. Advocates will meet with their legislators and/or their staff and hear key legislators speak about current, critical issues in the Legislature. FAN is also very involved in our two other advocacy days in Yakima (central Washington) and Spokane (eastern Washington). CARE FOR GOD’S CREATION: LOPPW’s director recently joined the leadership team for the Wisconsin Climate Table, which is made up of 28 organizations aligned behind four campaigns to diminish carbon dioxide emissions. LOPPW is part of the Clean Power Plan campaign. One of the members of the South-Central Synod/LOPPW Care for God’s Creation Team has become a regular speaker on climate change via the synod’s speaker’s bureau. We have begun strategizing approaching local municipalities about their policies on renewable energies. LOPPW is staying alert for bills that would weaken regulations on Wisconsin wells that, according to a state senator, are expected to be proposed this legislative session. LOPPW’s environmental focus is on climate change and clean water. ADVOCACY MINISTRY: LOPPW’s director recently led a workshop on Martin Luther and economic justice and spoke on a panel of advocate s and community organizers at the La Crosse Area Synod’s event, ACT: Action for Community Transformation. One person so far has volunteered to create a synod team that will help give congregations guidance in the area of advocacy ministries. IMMIGRATION: Along with staying alert for proposed bills related to immigration, A LOPPW council member and staff are networking with a statewide group that promotes workers’ rights, immigration reform and sanctuary. 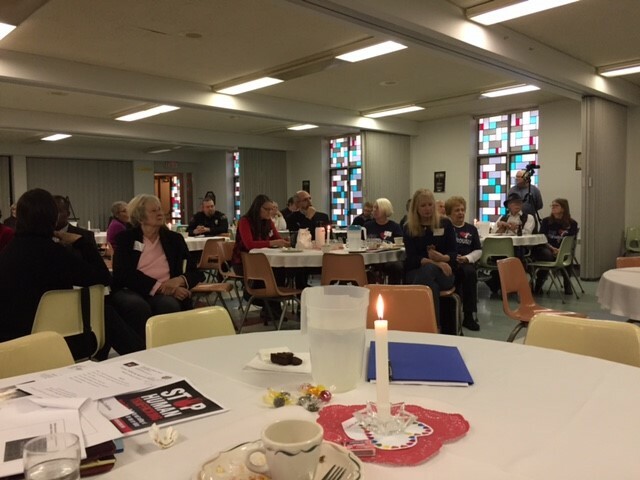 ANTI-HUMAN TRAFFICKING: LOPPW’s director was a keynote speaker at a community-wide forum on anti-human trafficking at an ELCA congregation in Janesville and encouraged participants to respond to proposed legislation in the Legislative Reference Bureau (see photo).